I've run away and am back home in Oregon for a few days, enjoying much needed time with my family. Since I'm enjoying myself way too much, I've asked our DIY and Crafting contributors from Find it Make it Love it to show us how to make our own DIY Chalk Paint! Trust me, it's worth the read. Take it away, girls! Much less expensive than the name brand. Can use any color you want. 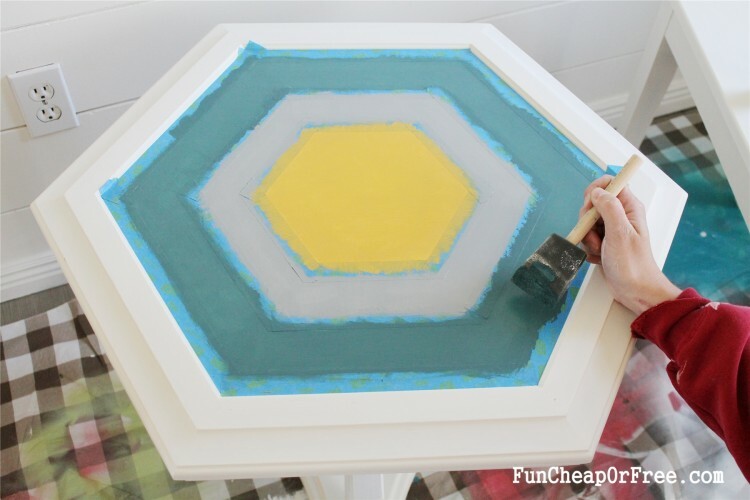 It's true, no sanding required! 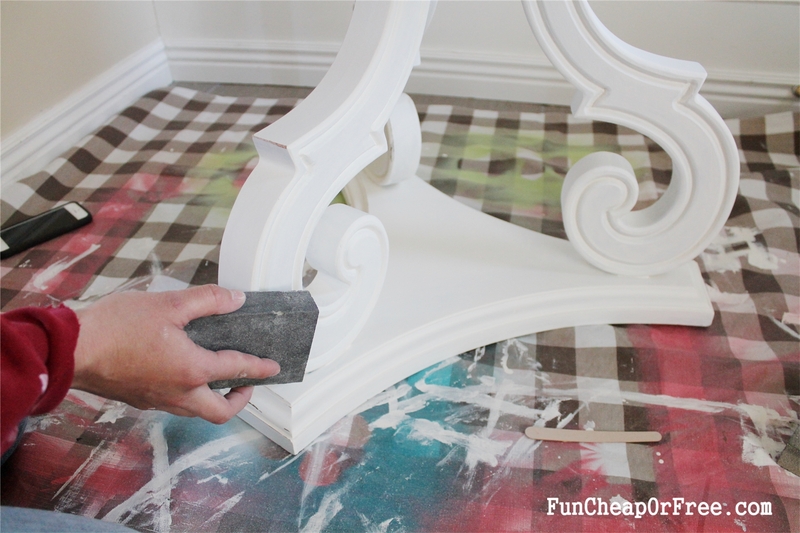 As long as the furniture does not have a heavy lacquer finish, this paint will stick! 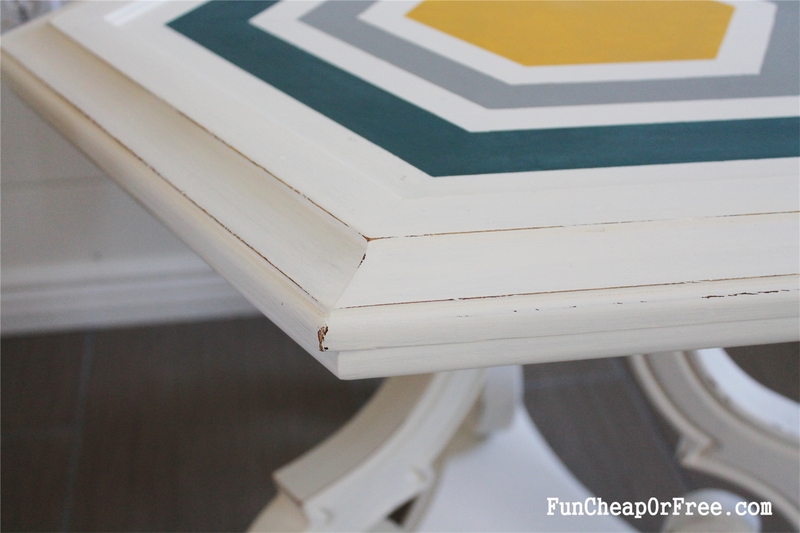 We have painted dressers, tables, nightstands and even a piano with no sanding! If you're following along with Jordan's 30 Days of Positive Change Challenge, we've got you covered for at least 3 of the challenges! Ready!? 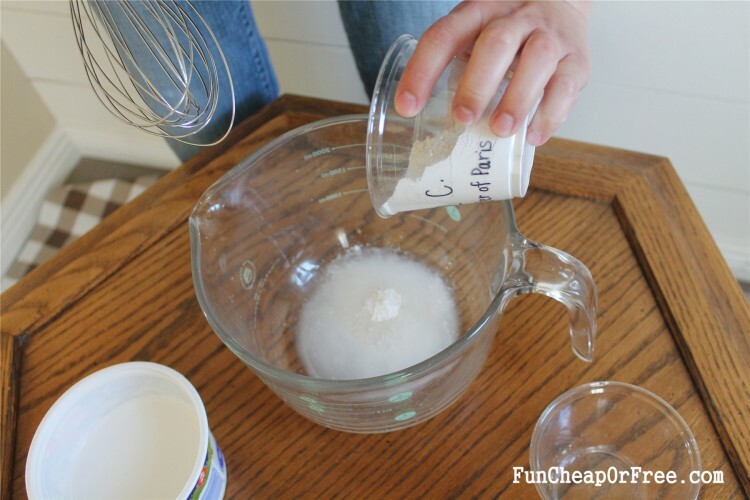 Before starting, wipe down the furniture using a de-greasing cleanser if necessary. 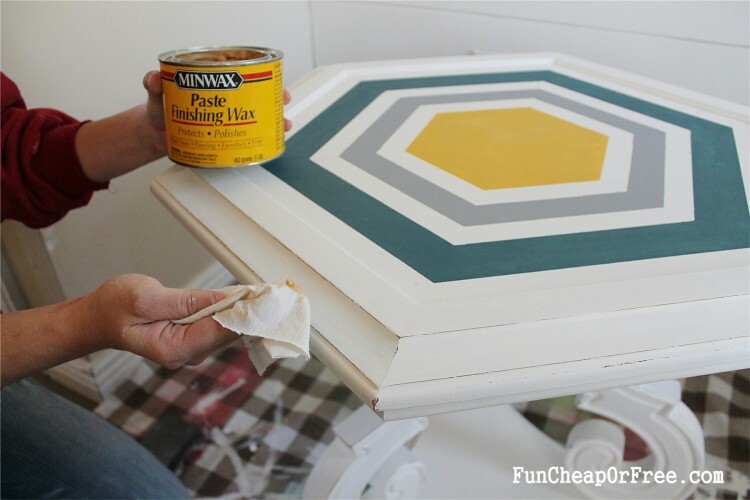 Here's a couple helpful tips: if you're painting a small piece, just buy the sample size of paint from The Home Depot for about $3-it is exactly one cup! 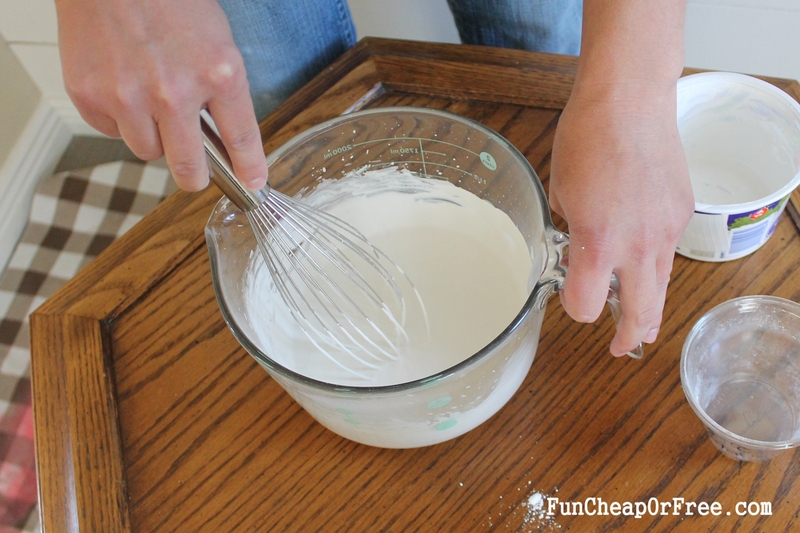 Plaster of Paris can be found at Walmart for around $5 a box, and a box will last a long time. 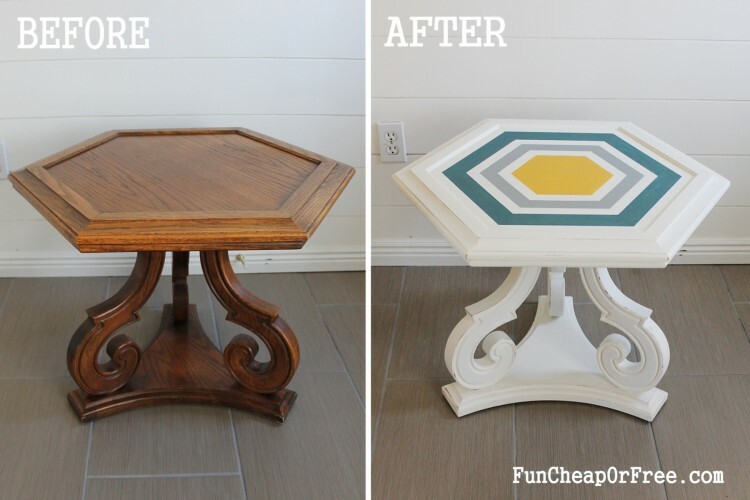 So for under $10 you're on your way to a fabulous furniture update! 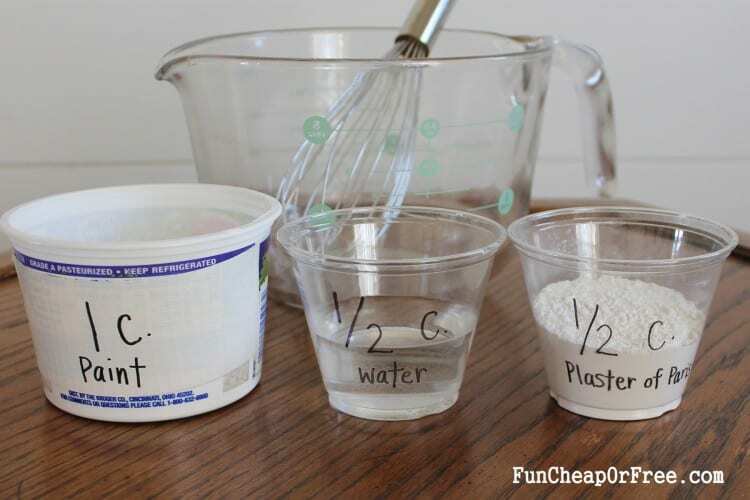 Pour the water and the Plaster of Paris into the bowl. Mix the two together with the whisk VERY well! 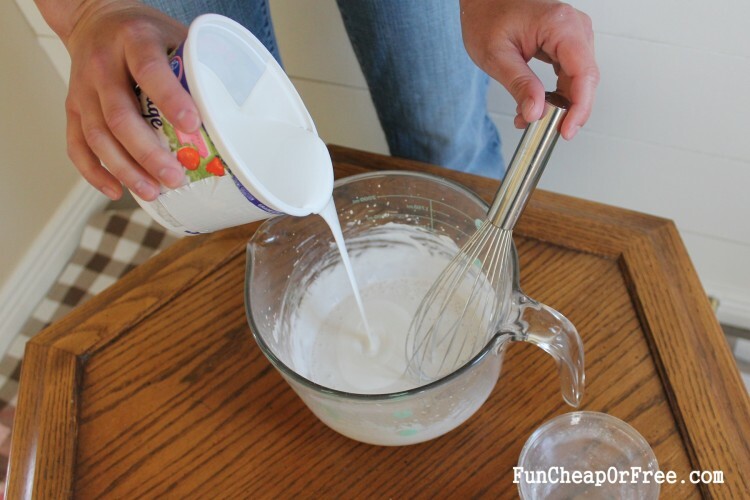 This is the trick to perfect homemade chalk paint! 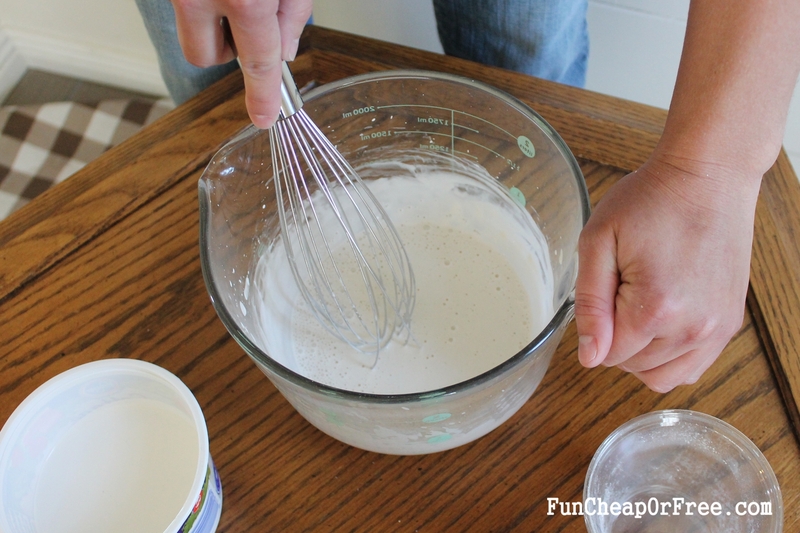 and mix until well blended. A foam brush works best, then just start painting. As we mentioned, the paint dries super fast. It can be re-coated after about 10 minutes. 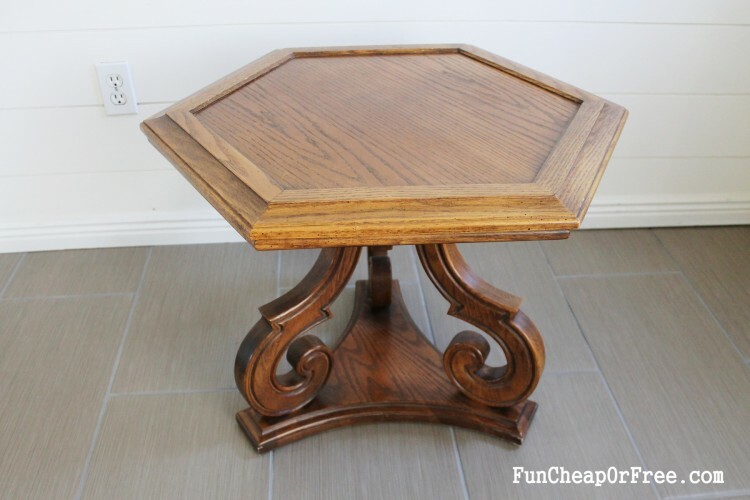 See how good it looks after a few more coats? 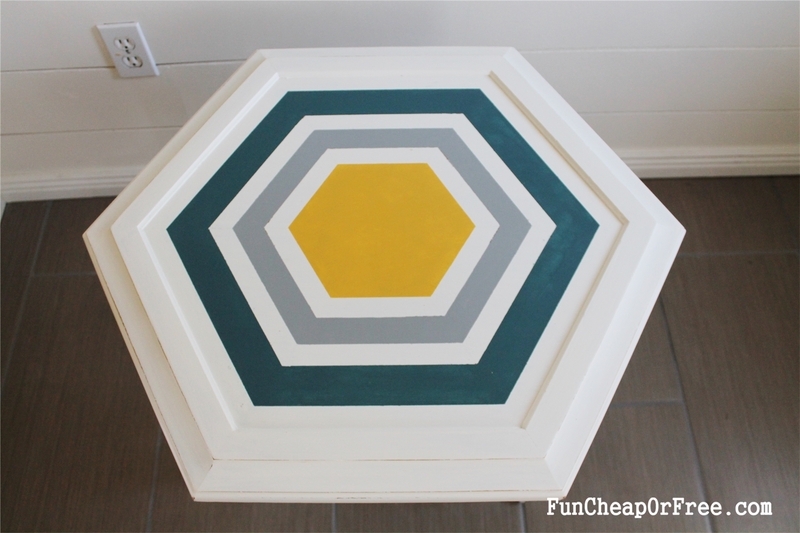 ;) We painted 4 coats on this table. With such a cool hexagon top, we wanted to do a little something special. 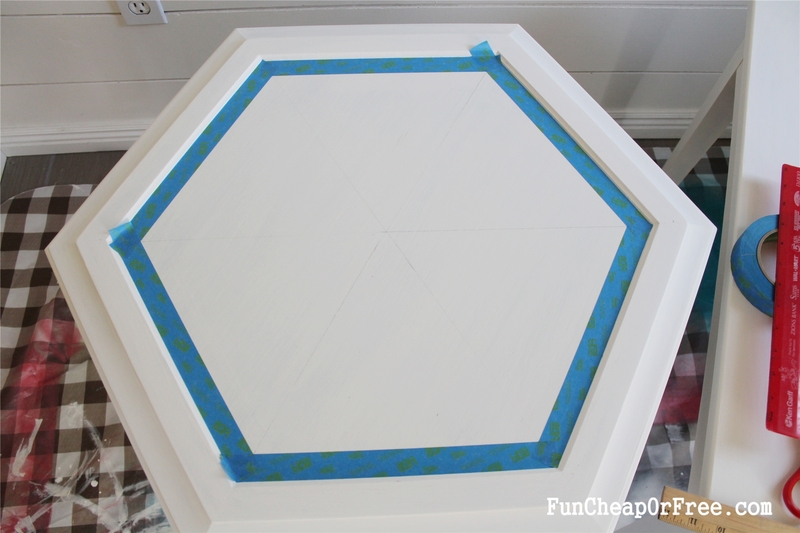 We taped around the outer edge with painter's tape to start our design. Then used a ruler and pencil to lightly draw lines from corner to corner. This gave us a guideline for the rest of the design. With a box cutter and a ruler , we trimmed lightly trimmed any tape hanging over. 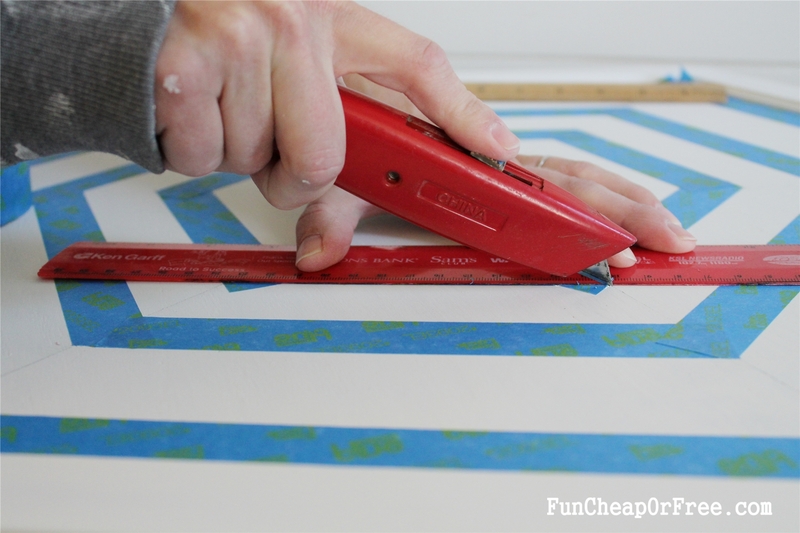 When painting with stencils, whether it's an actual stencil or just painters tape, be sure to paint from the edge of the tape inward. 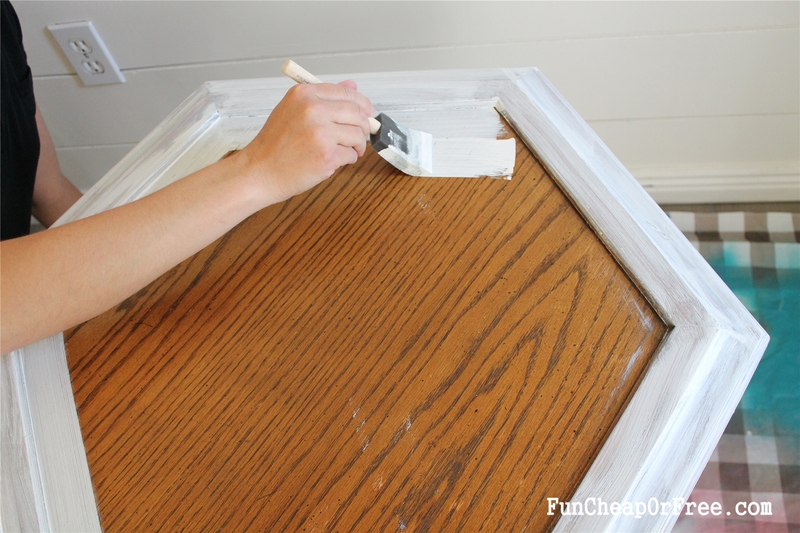 This will prevent the brush from pushing paint under the tapes edge. Perfect lines are a big deal on a project like this! 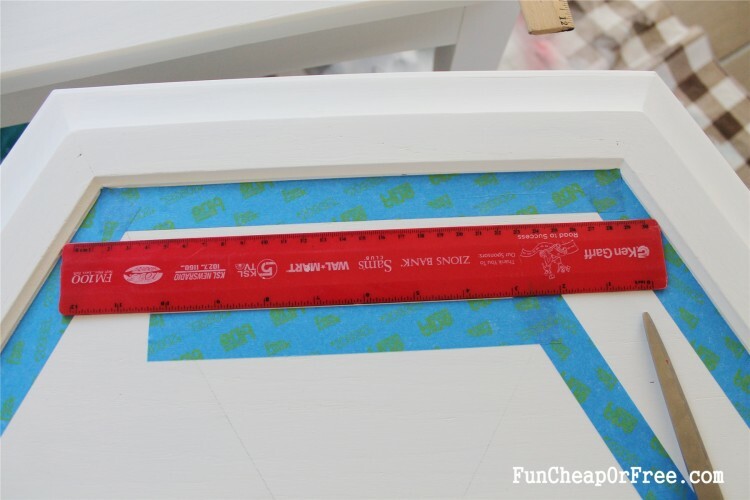 Once you're done painting, carefully pull off the tape. For the charming distressed look, sand along all the edges with sandpaper, letting the dark wood underneath peak through. Seal it with a good finish. Our favorite is Minwax Paste Finishing Wax., which is also found here . It is easy to apply, and it holds up perfectly! In just a few hours a piece of furniture can be totally changed! Be sure to stop by Find it, Make it, Love it.com for more ideas! Thanks ladies! I hear everyone talking about how fabulous chalk paint is, and now I understand the glory of it all 🙂 Thanks for sharing, and have a fabulous weekend! 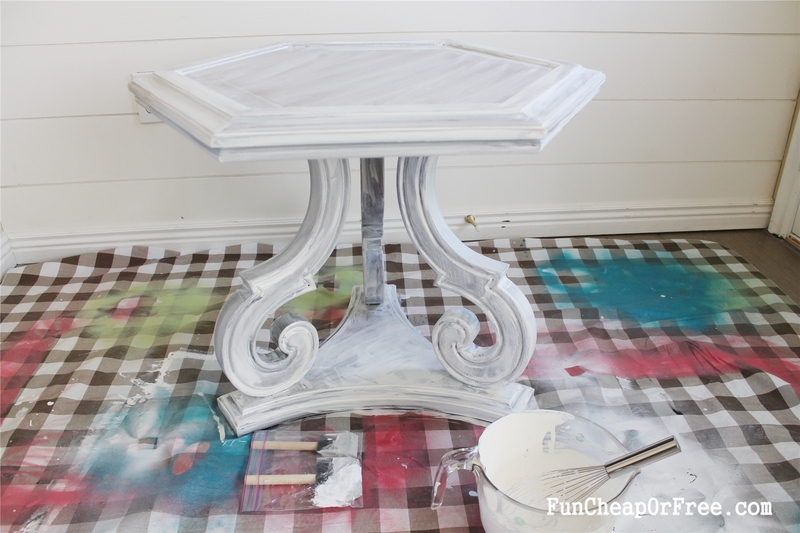 Homemade chalk paint is to much fun! It does stick to everything and provides great coverage. I have a cheapy kitchen hutch in my garage just waiting for me to make her pretty with some chalk paint. 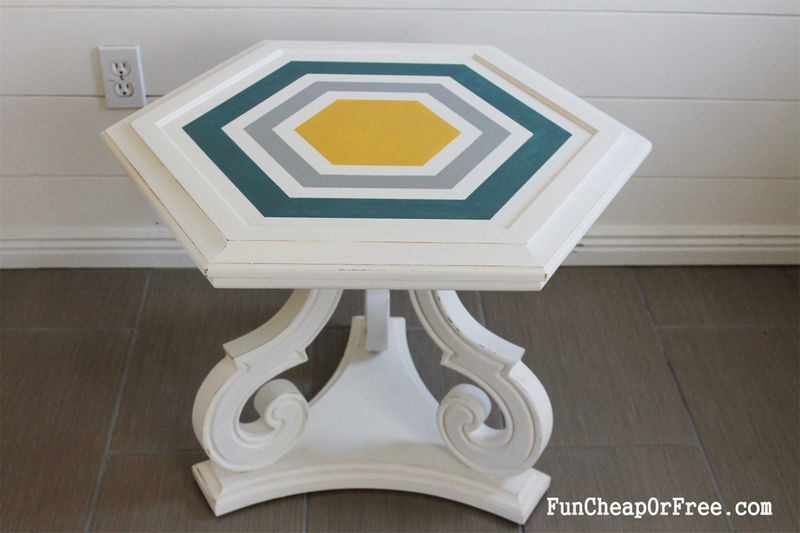 I love the colors and pattern you have used on Grandma’s table! Awesome job! I’m assuming you use colored paint to color your own paint? 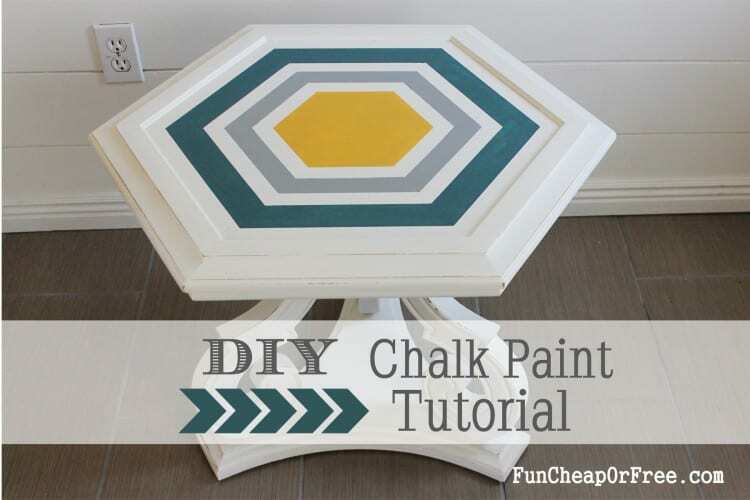 is this the same as like a chalkboard paint? found you through roadkill rescue and love this tutorial! 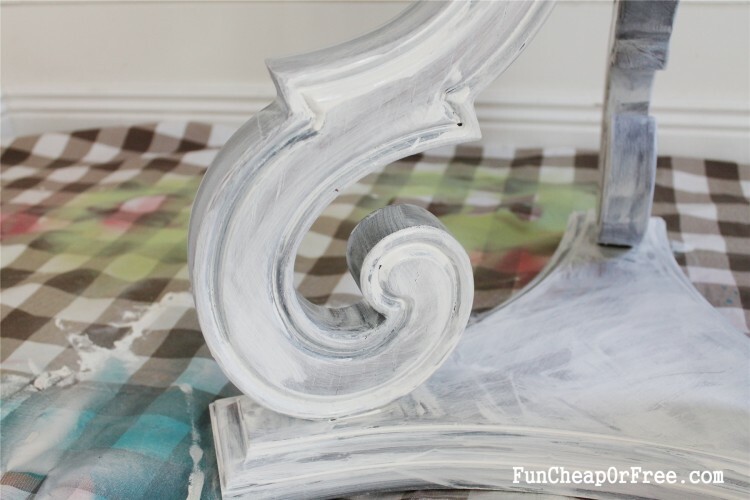 i’ve been buying my chalk paint on ebay and it gets expensive!!! 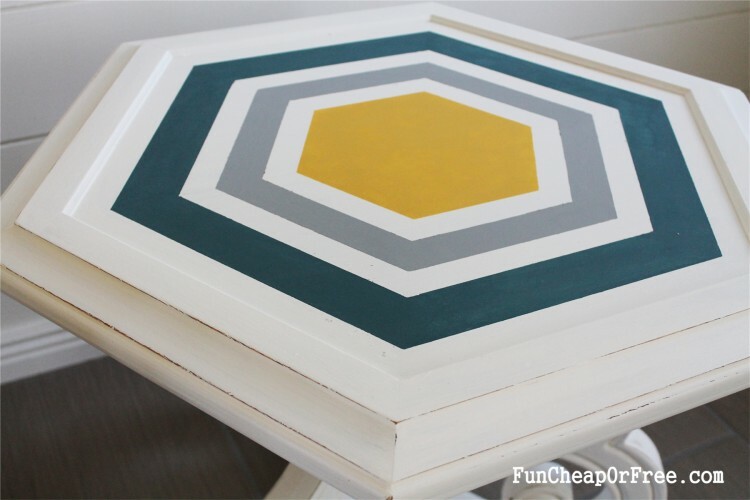 i love that i can make it myself now.. also i love the way you finished this table.. i’ve never used finishing paste though– always poly. what is the difference between the 2? would poly yellow over white? 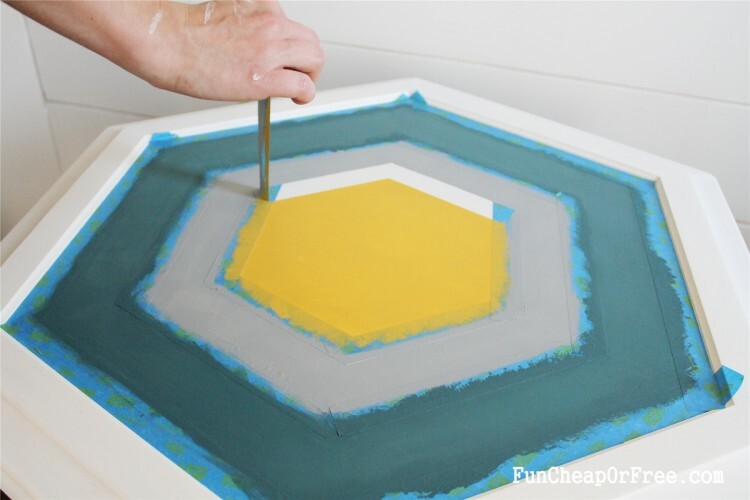 we use the water based now since it’s so much easier to work with and if we’ve painted something with acrylic paint we always do a quick spray of a clear coat just to be sure the paint doesn’t run.. but maybe with finishing paste that wouldn’t happen? let me know.. also are there different sheens in the paste? thanks! 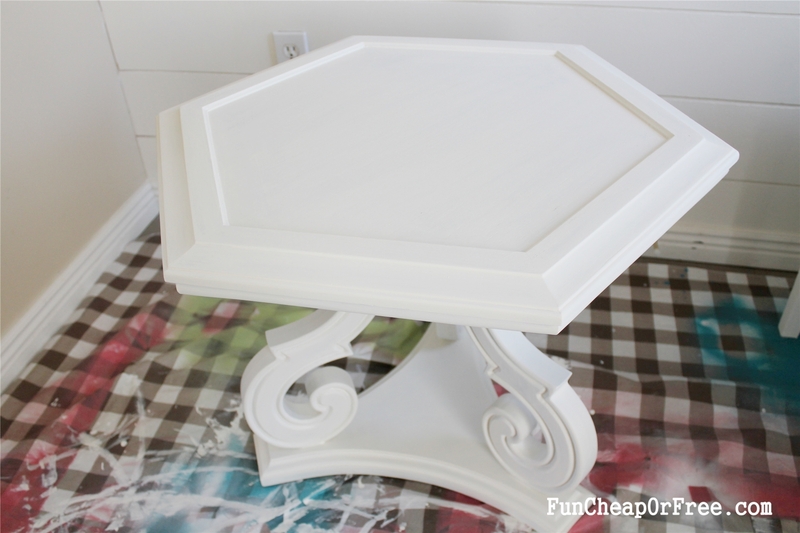 I was wondering if I could use chalk paint on top of that fake wood….. More of a plasterboard type piece. The cabinet i have is red and I was hoping to put yellow chalk paint on top and distress it so the red showed through a bit. But I’m unsure if the chalk paint will stick. Do I just need to sand the red fake wood first to allow the chalk paint to stick or do I need to prime first? If I do prime, will that get rid of the red coming through that I was hoping to achieve? Do I have any other options?